We welcome you to the world of magnificient landscapes, immeasurable spaces, unique nomadic traditions and amazingly friendly people, all that is Mongolia! Thoroughly selected here itineraries are the result of our professional experience consequently enriched by the advices from our trusted clients and partners. 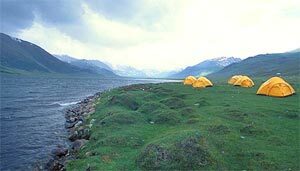 Trekking in the majestic high Altai region by taking this exciting adventure trip. This trekking tour takes you all the way to the stunning Altai mountain range in the remote western Mongolia. The Mongol Altai range has some of the most exceptional mountain scenery that one could ever see without any doubts. Trekking through the snowy mountains amongst the majestic peaks, you will be walking on Mongolia's longest glacier. The trip is yet cultural, taking you to the different ethnic groups like the Kazakhs- people with very different culture and religion, Khoton and Tuva people of Mongolia. You will admire the amazing nature and unique traditions during this wonderful trekking. When designing our itineraries and individual programs we cautiously consider idea of combaining country’s popular attractions, wild natural places, off - road adventures, contacts with local people and traditional events, those which can present country’s spirit and lifestyle. We invite you to check for the perfect treks in the wilderness areas, jeep overlanding trips throughout the vast country, comfortable classic tours, wonderful discoveries, colorful events, as well as winter tours during which people gather for traditional celebrations and festivities. Love trekking in the wilderness while viewing wildlife and getting to know more about the local culture? Then this trip is the right choice for you! Mongolia is heaven for those adventurous. Come and trek with us in the wild mountains that saved mighty Genghis Khan's life thrice and the visit the sacred lake of the Mongols! Landscape and cultural sightseeing blend easily in Mongolia - we will visit the ancient Buddhist monasteries and the most picturesque sights of the Khan Khentii mountains. This wonderful trip gives us the opportunity to get to know more about Mongolia and its history and their beloved Chinggis Khaan. We won't only visit the historical sites, but also we will visit the most beautiful natural sites of the country and hospitable nomads along the way. Feel the immensity of the nature. Trek through rugged mountain sceneries, rushing rivers, lush forests and along alpine lakes. Climb mountain passes and enjoy the beautiful views. Encounter the remains of a forgotten monastery. Pass by herds of cows, yaks, horses, camels and flocks of sheep and goats. Visit some herders' families on the way, experience their hospitality and get a glimpse of the traditional way of living of remote families. Those unforgettable trekking adventures through Mongolia's remote regions offer the trekker an unequalled experience of freedom. Imagine that you're walking in the mysterious Mongol Altai mountains, the highest peak of Mongolia!!! Our various treks will take you to the sceneries that active traveler should not miss whilst their stay in Mongolia. The trekking destinations range between the most visited areas near Ulaanbaatar city and the remotest areas in Arkhangai province. No other trips allow you to experience the Alpine scenery in Asia combined with the warmth of Mongolian hospitality.